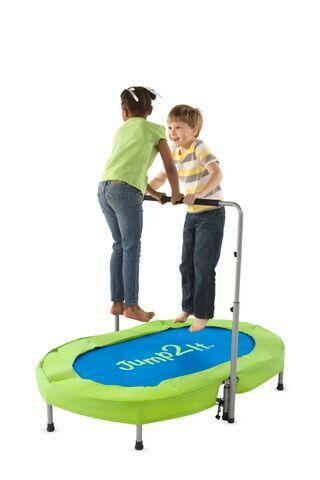 A trampoline built for 2. Each jumper has a half circle to jump within and both jumpers can share the central handle. Jumping routines start to spontaneously "jump" into imaginations and the fun really begins. Adjustable handle (approx. 24½"–35"H) is designed to grow with kids. Adult assembly and supervision required. Weight limit: 180 lb. Dimensions: L: 56" x W: 35" x H: 9"